Sam Vokes hit a landmark on Saturday, with his strike against Bristol City his 50th goal for Burnley. Vokes netted twice in nine games on loan from Wolves in 2011/12, before signing a permanent deal in the summer. 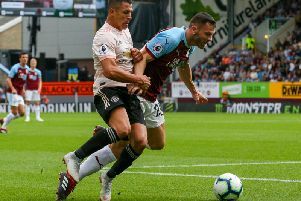 He has since claimed 48 in 182 appearances, including 21 in 44 in the 2014 promotion season, and 16 in 46 last season as Burnley returned to the Premier League as Championship winners. And the Wales international said: “I’ve just been told it’s my 50th goal in the tunnel. Vokes had a nomadic time after joing Wolves from Bournemouth aged 19, with five other loan spells other than his time at Turf Moor. For Vokes, it was a rare start of late, in the FA Cup against Bristol City, with Ashley Barnes having got the nod for the last six Premier League games. So a sixth goal of the season was a timely reminder to boss Sean Dyche: “Yeah, of course, a lot of the lads were the same, looking to impress the manager. “We’ve got a small squad and everyone is knocking on the door and ready to go. Vokes has seven goals in 19 appearances in the FA Cup over his career, but admitted: “I’ve never had a really good run, I want to try and crack on this season if we can. It was a good week all round for Vokes, who was at Anfield last Wednesday night to watch boyhood team Southampton reach the final of the EFL Cup. Vokes was spotted by a Saints fan in the away end, with the video doing the rounds on social media, and he smiled: “I was waiting for that one! I couldn’t believe it when it came out. My old man and brother came up for the semi-final. I haven’t watched Southampton in probably 10 years since I started playing football on Saturdays, so it was good to go along and support them. “It was funny, the boys had it on. The gaffer put the video of me trying to sing on!